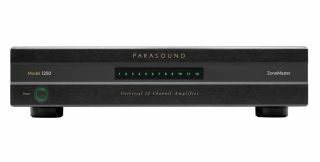 Parasound unveils new ZoneMaster Model 1250 amplifier | What Hi-Fi? US audio manufacturer Parasound has launched its new ZoneMaster Model 1250 – a 12-channel power amplifier that comes with connections for up to 24 speakers. The device is said to be "the first universal amplifier" that can power a high-end home cinema sound system at the same time as "additional zones with independent sources". Those 24 speaker connections let you use two speakers per channel, with the ZoneMaster Model 1250 rated at 12 x 50W into 8ohms and 12 x 90W into 4ohms. Each channel pair can be bridged to deliver 6 x 160W into 8ohms and 6 x 200W into 4ohms if you prefer, all channels driven, with independent line inputs and level controls for each channel. There are also two Bus inputs with looping outputs and a speaker-level input that can be routed into any zone, plus independent 12v and audio triggers with looping trigger outputs for each zone. The detachable Phoenix-style speaker connectors are able to accept up to 12-gauge wire and the Model 1250 also delivers 0.5W standby power consumption when not in use. Parasound president Richard Schram said: "The ZoneMaster Model 1250 is a game changer in a category populated by mediocre generic IC amplifiers. "The Class AB input stage and premium Class D power stage generate performance consistent with Parasound's heritage. It is as useful for distributed audio as it is for home theatre, where it could augment an AV receiver with 3 x 160W plus 4 x 50W." It's expected that the Parasound ZoneMaster Model 1250 will go on sale in the UK next month [December] with a price tag of £1995.